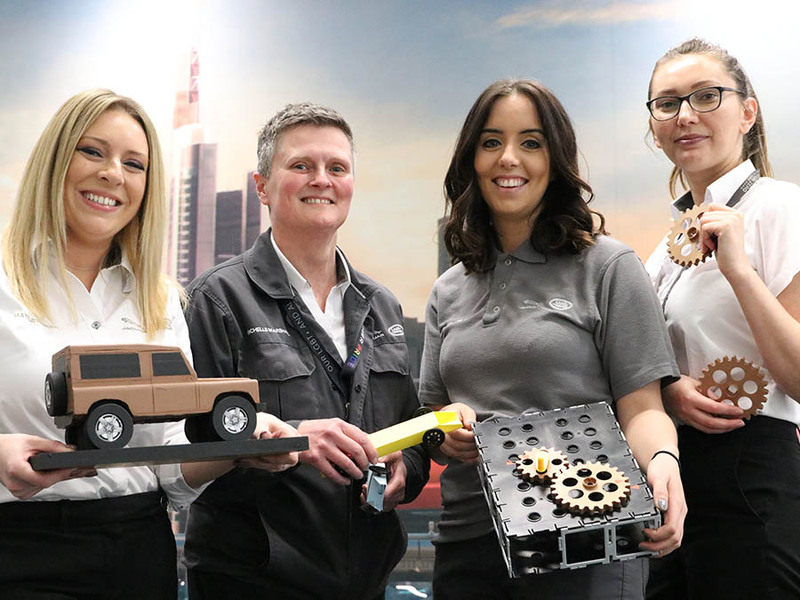 “These young ladies are the future and we should encourage them as much as possible to reach their goals,” said plant quality’s Hayley Read, who recently joined five other colleagues on a trip to three schools to inspire the next generation of female engineers. The annual event was organised through the facility’s links with Business in the Community and was directed at Year 8 girls, at Codsall, Perton and Bilbrook schools. Throughout the day the team presented to nearly 100 girls. Leading the team was Michelle Marshall, who works in the sub systems team in quality assurance. She had volunteered for the event last year, so knew what to expect. “We all come from very different areas of the business, an undergrad, a team leader, an engineer, some were a little more nervous than others, but we all supported and encouraged one another, which helped,” said Michelle. During the team’s visit to Bilbrook Middle School, they asked the pupils a few questions to find out what they knew about the EMC and also understand their dreams for the future. They also shared a presentation about the team and the facility, which included a couple of inspirational films to encourage the girls into engineering. Michelle said this approach worked to engage and encourage the girls to ask questoins. The second visit of the day was to Perton Middle School. All the women were becoming more confident in their presenting skills and had begun to relax. Michelle said: “The questions we received were really varied, from what qualifications needed to be an engineer, to how much do you earn? Team leader in the EMC’s Machining Hall Steph Kaye went along to support the event. She is the only female team leader at the EMC, something she’d be keen to see change. “My expectations of the event really was to try and make the Y8 girls realise that engineering isn’t just for men. I’ve been at the EMC for over four years, so I feel confident to talk about what it’s like and the roles that I have had during my time at the facility. “I don’t believe there’s enough women in engineering, or in operations. What I took away from the event, was that a lot of younger girls don’t realise what manufacturing is. I think they saw that there were different types of women in our group and a real diversity in the types of engineering jobs possible. Plant quality’s Hayley Read also found the event interesting, although she was a little hesitant at first about having to speak in front of a large audience. “I think it’s an important message to get across to young women, that they can do whatever they put their minds to. You don’t have to be a man to make it in engineering. My expectations of the event really was to try and make the Y8 girls realise that engineering isn’t just for men. I’ve been at the EMC for over four years, so I feel confident to talk about what it’s like and the roles that I have had during my time at the facility.